UK, France, 1991, 92 minutes, Colour. James Fox, Fanny Ardant, Paul Mc Gann. is a British psychological thriller co-written and directed by long-time Bertollucci collaborator, Mark Peploe. The film is a British- French co-production hence James Fox as the father and Fanny Ardant as the mother. The film has a particularly strong cast in supporting roles. The film focuses on a young boy and his blind mother, policeman father, a slasher terrorising blind women at an institute, his confrontation of the slasher (played by Paul Mc Gann). 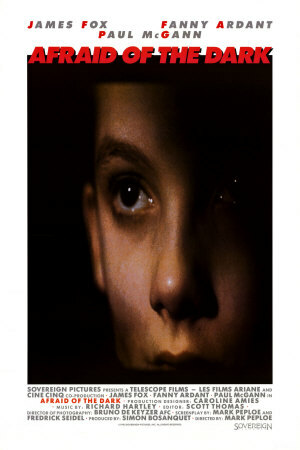 However, the film changes gear in the middle - indicating that the first half has been occurring solely in the mind of the young boy. The atmosphere of the first half is particularly strong, with a sense of menace. The second part, still with a sense of menace, but more realistic, is somewhat flat in comparison. However, the film gives great attention to atmosphere, detail, especially with the world of the blind in the first part of the film. The film is a particularly British psychological terror story. 1. British- French co-production? Combined ingredients? Horror, thriller, psychological? 2. The atmosphere of London, the suburbs, day sequences, night? Interiors? The cemetery, the train line and tunnels, stations? The surgery? The film's great attention to detail, physical and psychological? The musical score? 3. The title as it applies to Lucas, to the terrorised women, to the audience? 4. The opening with Lucas and his glasses, his tapping them, the knitting needle? Glasses and sight as a motif? The knitting needles? The first half in his imagination, creating stories about people that he knew, his parents, sister and brother-in-law? How much reality or not? The psychological story and insight? 5. Lucas and his age, his being physically well, nothing wrong with his eyes? His policeman father, blind mother, overhearing the story about the slashings? The house, the holidays? Stealing out at night, his love for the dog and feeding it? Not obeying his father and not telling the truth? Going to the Institute with his mother, seeing the women at work, their knitting lessons? The slash story? His following Lucy, the sense of menace, her being slashed in the house? His accompanying Rose, going to the artist's studio? Her fiancee? His suspicion of the window cleaner? Wandering the suburbs, his friend away for the holidays, the snappy landlady? The dog? His hearing about the slashing, going back to the Institute, the police, the Head and the women scared? His concern about his mother? In the train line, the tunnel, hearing the story of the slashing on the station? His getting out of bed, climbing along the roof, going to play with the dog, his fear of the prowler? Going to the studio, seeing Rose posing, the artist and his slashing - and his piercing his eye with the knitting needle? A British variation on the slasher's story? British style and fantasy? 6. Lucas in the second part, his eyes, failing eye sight, the need for the operation? The normal background of his family, his father the florist, his mother seeing? Preparations for the wedding, Rose and her enthusiasm, Tony? The car, going to the ceremony, the photographs - and his looking with the group (and imagining them as blind)? His pregnant mother, the ceremony, her going to the hospital? Lucas left alone, his glasses broken, going to the shop and getting the new glasses, the comment on the frame? The proprietor and his tapestry? His loneliness, the birth of the child? His accepting it? The dog terrifying him at the window and his stabbing it, trying to dispose of the body? His jealousy of the baby, protectiveness? Taking the baby? His father and the men pursuing him, taking it to his favourite house? Pursued, the baby saved, the operation? His mother allowing him to hold the baby and his being re-assured? 7. The two different portraits of his father and mother - as they were, as he wanted them? His mother blind, kind, at the Institute? His wanting to protect her from the slasher? Her pregnancy, love for her son, the giving of birth, letting him hold the baby? His father as policeman and his pride in his father getting things organised, helping the blind people? His father as the florist, the bouquet, at the wedding, taking his wife to hospital, pursuing Lucas with the baby? 8. Rose as blind, her fiancee, going to the studio, her fears? Posing and the slashes? The real Rose and her enthusiasm about the wedding, the happy marriage? Tony as painter, sinister, slashing and his eye being pierced? The real Tony, enthusiasm, happy marriage, going off in the car for the honeymoon, pursuing Lucas? 9. Edith and her being slashed, Lucy and her walking home, Lucas behind her, in the house, sensing someone there, being slashed? The comparisons between the two Lucys and Ediths? 10. The Head of the Institute - and his appearing as the proprietor of the glasses shop? 11. The window-washer, sinister or not? The young man and his taking the photos? Men as genial, as sinister? 12. The dog, his owner, Lucas loving the dog and feeding it? The dog terrorising him and his destroying it? 13. The overall effect of this double portrait of the child, of the people in his world? Using the techniques of the horror slasher movie? Transforming it into psychological terror?